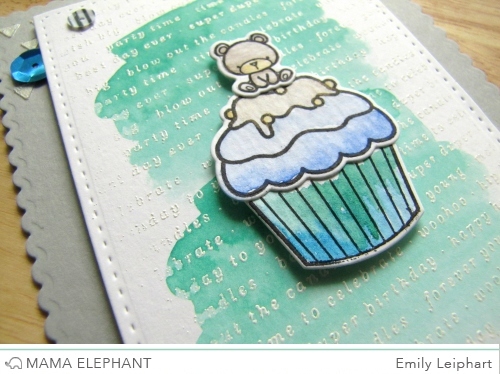 mama elephant | design blog: Sentimental Borders with Emily! 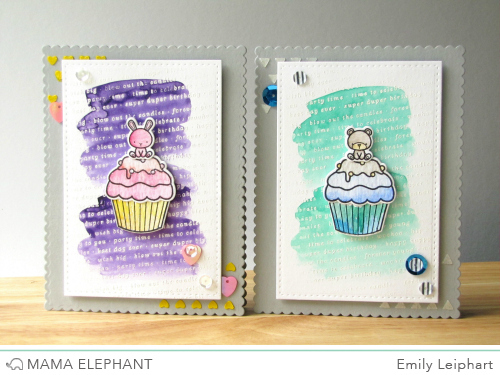 It's Emily here today, and I'm showcasing the Sentimental Borders stamp set. 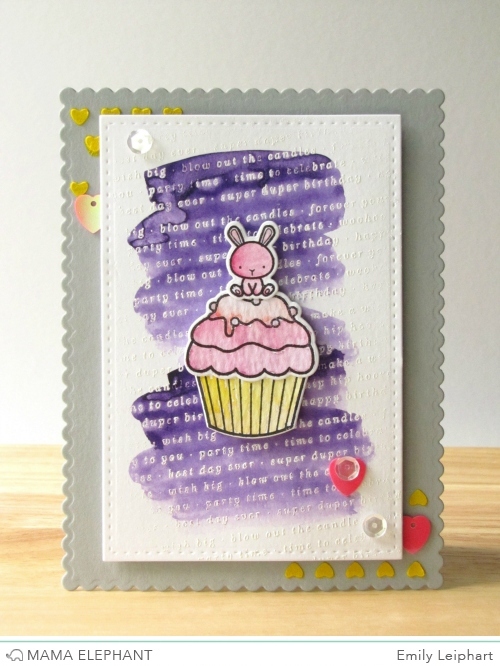 I stamped it with Versamark ink on an angle on watercolor cardstock die cut from Index Card Creative Cuts. After heat embossing it with a faded edge, I watercolored over it with Gansai watercolor paints. On the scalloped card base, which was die cut from Femme Frames Creative Cuts, I used the heart and triangle borders from Embellished Tag Creative Cuts to create my own stencil for embossing paste backgrounds. Femme Frames and Embellished Tag are also sold together in the Basic Set, along with Dainty Bow and Bold Banner. 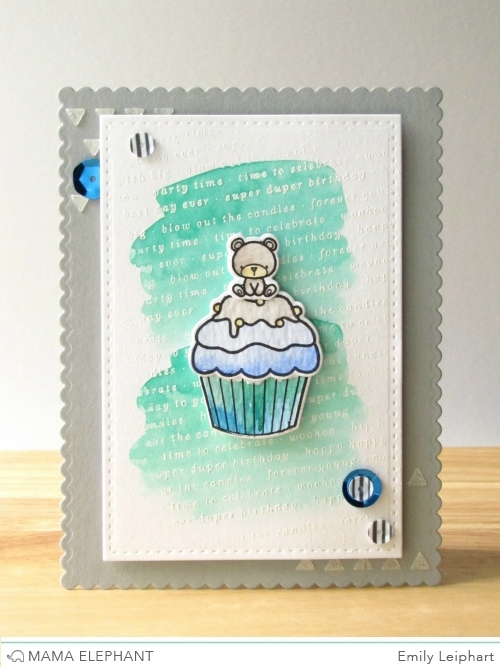 I knew that the twin recipients of these cards were celebrating their third birthday with cupcakes so I added the yummy cupcakes and adorable animals from Carnival Cupcakes (+ Creative Cuts). To finish, I embellished the embossing paste corners with gorgeous sequins. Emily has knocked these sets out of the park. Simply adorable and quite lovely. Particularly like the embossing paste touches. 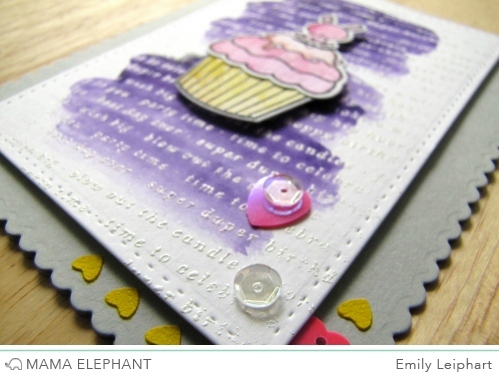 As usual gorgeous cards Emily! These are totally, sweet! Love! These are brilliant! Really helpful video too, thanks for that! Awesome cards and video. I need to get those gansai paints! Both cards are really darling! I love how the cupcakes pop against the water colored background...so sweet!